Below you will find updates to the site along with any news happening within the county. Should you wish to keep more up to date, then please see our Facebook link at the bottom of the page. In order to aid our research and to increase the accuracy of our site, we need some help. We have come across many instances of conflicting information in reference books that we've used in compiling the site and this has prompted us to try and use original materials wherever possible now to maintain accuracy. If you spot something that's obviously wrong on the site, please contact us and we'll correct it. Available from Amazon, EBooks, Kindle and selected other bookshops. I've been sent a copy of this book by the author. I'll state now that it is a page-burner - I read it over a couple of days immediately after receiving it, and then again at a slower pace a few weeks later to go over some aspects of the story. 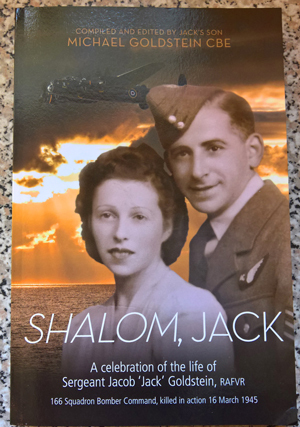 The subject of the volume is the author's father, Sgt Jacob 'Jack' Goldstein, a mid-upper gunner on 166 Squadron at RAF Kirmington. Jack was one of a small number of Jewish aircrew who flew in Bomber Command. He flew under his real name, unlike some who assumed an Anglicised identity to protect them in the event of capture. Jack's story begins with details of his grandparents' life in Poland and the harsh life and poor prospects their children left behind when they moved to London.The hardships they faced on arrival, and their determination to forge a better life in Britain make for enlightening reading. There is a wonderful description of life as a child in the Jewish community in the East End of London, which must surely resonate with anyone who grew up in that area. Jack's parents worked long, hard hours to make a living in the East End in the 1920s and 30s. Their industry ensured that their family was provided for as they grew. Times were hard during the depression years, and tensions rose palpably with the inexorable rise of Nazism across Germany, but also with the rise of Fascism in Britain. At the outbreak of war, Jack's wife and children were evacuated from the East End, leaving Jack and his brothers to run the family business through the Blitz. The family returned to London, but the dislocations and disruptions to family life caused by the war are described well. Jack followed his brothers in signing up to fight. He was accepted as aircrew and his journey from training to arriving as an air gunner on a front-line squadron is described, nicely illustrated by excerpts from letters to his family. Jack's crew were posted from 1667 Heavy Conversion Unit at Sandtoft to 166 Squadron at RAF Kirmington on 5th January 1945. The first month would have been spent working up as a crew to being declared combat-ready. Their first operation was against Mannheim/Ludwigshaven on 1st Feb 1945. Their other 15 ops, including the last one, are also covered. The crew were airborne in Lancaster RF154 to Nuremburg on the night of March 16th when they were shot down approaching the target. Six of the crew bailed out and survived, but Jack was killed. His body was recovered from the wreckage of the aircraft and buried in a communal grave with the remains of another crew at Schwabach. The latter half of the book covers the events around the shooting-down as told by four surviving members of the crew as recorded by Jack's brother, Ron, and of the family's search for closure. After they had been repatriated at cessation of hostilities, several of Jack's crew attempted to contact his widow, Sadie, to tell her first-hand of what had happened. Today, it's easy to visit the CWGC website and instantly find the grave locations of airmen buried in Europe, but during the post-war years it was not a easy. Jack's body was exhumed from Schwabach and reburied in the CWGC cemetery at Durnbach after the end of the war. Sadie made some attempts to find out more about Jack's grave during the 1950s, but it was not until 1979 that she told her son of their intention to visit. The visit, made during a family holiday, led to the author making several more visits and set him on a quest to discover exactly what had happened. His research and subsequent contact with villagers who had witnessed the crash are described in detail. His account of how the facts of the crash have been teased out from a fog of sometimes conflicting recollections is a joy to read, and was instantly familiar from my own experiences of research. The book succeeds in bringing to life Jack's story, and that of his family as well as the family's search for closure in terms of what happened on the night of 16th March 1945. It's a well-rounded, easily readable book written in a conversational tone - ideal for sitting down with on a long winter's evening. Stuck for something different for a Christmas present? Want to 'light the afterburners' at teatime? Or maybe you're just looking for something to warm you through after a cold crisp autumn/winter day spent taking in the County's aviation heritage sites? 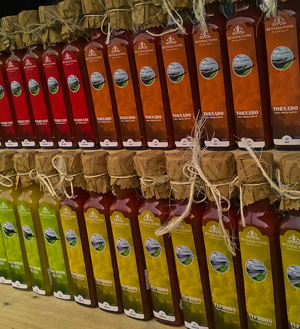 Mark Burrell and his team at Bennington's Original Sauces, based just outside the County in Newark, have produced a range of aviation-related chili sauces made from fresh ingredients. Each sauce has it's own unique flavour and characteristics. The sauces range from mild to extremely hot. The Lancaster is the mild sauce, a lime & lemon chilli drizzle which works well with seafood and lighter meats. The four sauces based on Naga chillies are tomato-based with subtle variations on flavour and definite steps up in heat between each one. Typhoon is a medium heat, Tornado is a hot sauce, the Hurricane is rated 'very Hot' and the appropriately-named Spitfire is labelled 'Extremely Hot'. Unlike a lot of commercial hot sauces, this range obtain their heat from the chillies themselves and do not use capsaicin extract. This means that the sauces are more about the flavours than the sheer amount of heat. They do live up to the ratings on the labels, but are sufficiently tasty to be used as dips or table condiments rather than brought out for trying as a dare. The first phase of this project is now complete - the Spire is in place and surrounded by the etched metal walls containing the names of those killed whilst serving with numbers 1 & 5 Groups in Bommber Command during the Second World War. Further funding is still needed to complete the planned works on this important site. 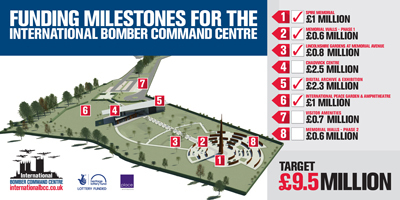 Please consider donating to this worthwhile project and show that the sacrifice and memories of Bomber Command veterans will never be forgotten. Please click on the above image for more details or to make a donation. The "Events Calendar" will be updated as we receive details of events in the county, so please check for new events on a regular basis. We apologise for the lack of updates to the website currently, but the research we have undertaken for the forthcoming book is taking up most of our time. Once the book is finished we endeavour to carry on with both adding new content to the website and reviewing what is already on display, so please bear with us. Thank you.